Ringo’s Gift may remind you of some soft guitar chords and the dulcet harmonies of one of the all-time greatest pop bands. SoCal’s Select has harnessed the sweetness of this strain, named after cannabis activist and CBD pioneer Lawrence Ringo, and not the Beatles (I know, you’ll get over it). But I wouldn’t be surprised if Lawrence hummed a Beatles tune or two during his 35 years as a hybrid specialist on his Southern Humboldt farm. With equal parts CBD and THC, this vape cartridge offers a fast-acting way to experience the “entourage effect,” which thankfully doesn’t mean a marathon of the series, but rather the whole-plant benefits that maximize the restorative effects of cannabinoids. 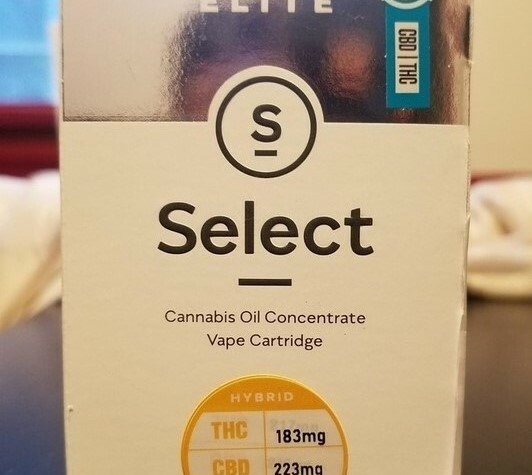 In this complete review we’ll dive into the specifics of the Select Elite Ringo’s Gift 1:1 CBD:THC .5g vape cartridge. All questions will be answered. Yes, there will be an answer. Let it be…Okay, I promise that’s the last Beatles reference. The cartridge comes in a well-constructed cardboard box, though it could easily crush under some weight, with foolproof opening instructions. The graphics are simple yet clean with a hint of modern elegance. When I did get busy freeing the Select 1:1 cartridge from its constraints, I reached the child-proof, tamper-resistant packaging. It was slightly challenging to free the lock and remove the cartridge, but that could’ve been user error. A steady diet of gin and tonics can sometimes do that, but what can I say? I’m dedicated. 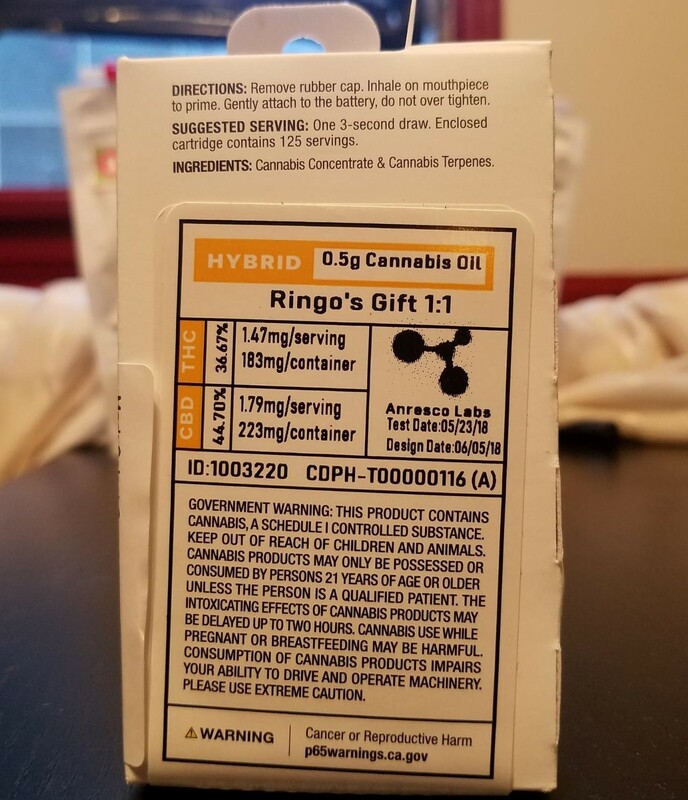 This Ringo’s Gift cartridge has sufficient key info: brand name and logo, strain type, strain name, size and weight, 183mg (36.67%) THC and 223mg (44.70%) CBD content, lab testing, usage instructions and health warnings. However, I prefer more comprehensive information like the full cannabinoid and terpene profiles, extraction process along with harvest, processing and expiration/best by dates. Inside, the vape cart has a white “S” stamped on it, along with a peelable sticker that says “RIN,” short for Ringo’s Gift, with the milligram potency listed. I love this simple, unique feature as it helps me tell it apart from my other unmarked cartridges! 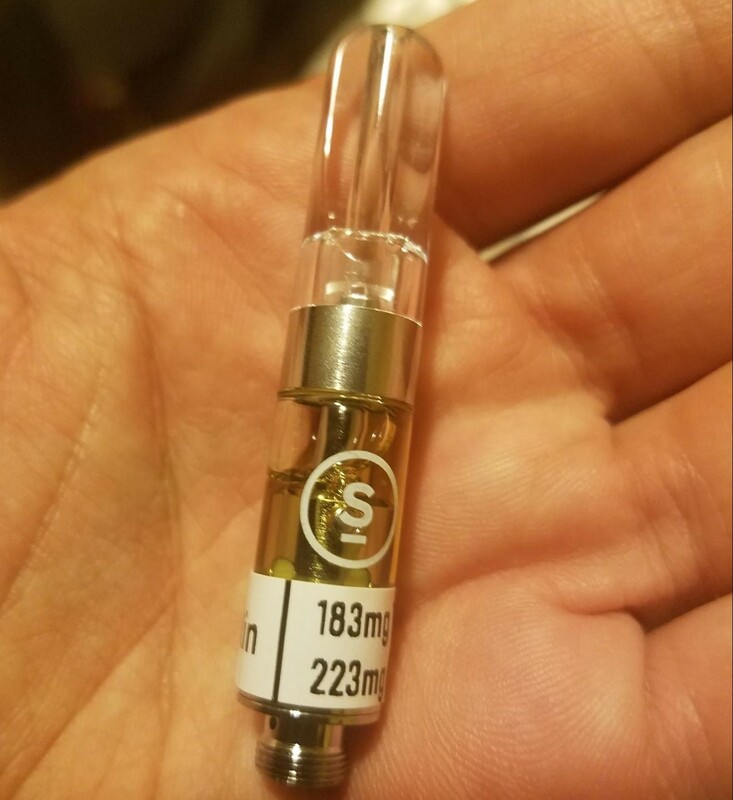 This small detail matters if you own several and/or need to know the exact cannabinoid content for balanced relief, like this majority CBD vape oil. Like other high-quality cannabis manufacturers, Select uses locally grown organic cannabis to make their proprietary, solvent-less cannabis oil. After sampling this relatively balanced Ringo’s Gift 1:1 cartridge, I understand why the brand gains high praise. Select uses top-of-the-line ceramic core technology, giving me the option to draw larger, longer hits. While the cartridge is made of glass and metal, Select has opted for a heavy plastic mouthpiece that’s transparent, narrow and comfortable on the lips. This balanced vape cartridge is compatible with most 510-threaded vape batteries, although Select recommends using theirs to ensure cleaner and more effective results. On the inhale, I wasn’t sure if I liked the taste; but as I exhaled I got a wonderful reminder of how much I love CBD-rich strains. It’s kind of sweet and sour with an earthy, cherry undertone. This flavor always comforts me, but that could be because I associate it with the comforting effects of CBD itself. For optimal taste, hold the 1:1 cartridge upright and take a few small puffs prior to activating/heating the vape oil. Ringo’s Gift is a high-CBD strain I love for its gentle, soothing effects that don’t leave me feeling out of control. The 1:1 CBD:THC ratio makes for a calming and relaxing high. You’ll still feel those psychoactive hybrid properties, which might be difficult to distinguish if you’re a newbie, while the slightly higher mix of CBD keeps them in check, leveling out some of THC’s more undesirable effects. Before taking my first puff I was wound tight from work after dealing with some very impatient people. Three hits on the couch later, my tension gradually began to subside. Then, about a half hour later, I sat up and notice my shoulders, lower back and feet felt light for the first time all day. Great for daytime pain and inflammation. My thoughts also slowed down from the day’s drama and I didn’t lose any functionality. This is a stealth healer. Thanks, Ringo! Presented in a well-constructed cardboard box. Potentially easy to crush; a bit hard to free the child lock. Sufficient basic info and cannabinoid percentages (which I dig): 36.67% THC and 44.70% CBD. Includes stickers that can be easily peeled and re-attached to the cartridge for easy identification. Would like to have seen details about the extraction process, terpene profile, best-by dates, etc. Cartridge remains clear and unclogged until the last drop. Consistently provides a quality puff. Great “mouthfeel” with the plastic mouthpiece. Flavor-wise, this product isn’t remarkable – but isn’t bad. Slightly harsh taste initially, but then I experience earthy cherry notes reminiscent of high-quality CBD-rich strains. At the end of the day, I wanted a little more of this good aromatherapy from this Select cartridge. Be careful not to take in too much of a good thing at once! I was over-eager and coughed a bit with the higher temp capability of this vape. Stick to a low heat setting and a three-second draw for maximum enjoyment. Thick, beautifully golden oil; crystal clear. Incredibly easy to use; smooth puffs. Compatible with most mainstream batteries (510 threaded). Consumers still feel the psychoactive properties from the THC, but the high mix of CBD levels out the effects of THC. Select always delivers the same experience time after time. Ringo’s Gift 1:1 maintains the same look, taste, pleasure and relief. For around $50, it’s relatively affordable considering the quality of the cartridge, potency and positive effects. If you’re experiencing mood swingy-ness, unease or aches and pains, Select’s Elite 1:1 Ringo’s Gift cartridge will have you feeling fine in no time. The brand earns bonus points for including a strain-specific sticker to help identify the cartridge and its effects. However, it loses points for falling just shy of the info I need to wholeheartedly endorse a product. In the future, I’d like to see a bit more varied product information instead of the same news printed several times in multiple locations. I’d love to see additional cannabinoid levels and all the detectable, delectable terpenes as well, please! Until then, I’d still happily use Ringo’s Gift to get high with a little help from my friends…sorry, I can’t help myself.